This past weekend, we took our first real beach vacation as a family. We've been once to the beach on the coast of Holland when Miles was a baby and then to Charleston last year, but we barely did more than just see the ocean on either trip. Josh and I have never been huge beach-goers as a couple, but I managed to snag a condo for Memorial Day weekend and just knew that Miles would love it. On Friday, we packed the car to the gills and set off for the Carolina coast. Taken with nikon d700 and sigma 85 1.4. ©2018 elizabeth glessner. 3 AM - One certain toddler climbs out of his bed and walks to the door. Realizes that we're in the room with him when Josh tells him to get back in bed. Proclaims he is "all done with his nap" and wants to go the beach. After refusing to get back in his own bed, put him in our bed in an attempt to get him to go back to sleep. He lays on my pillow and proceeds to whisper in my ear about collecting shells and playing in the sand. Does NOT go back to sleep. Turn on cartoons in an attempt to keep him still so that we can get more sleep. Lasts approximately 20 minutes before he climbs down and says he wants breakfast. 5 AM - Give up and get up with toddler. Make oatmeal. Brainstorm your sleep-deprived, uncaffeinated mind for solutions to the bright room that don't involve driving 20 minutes to the nearest Wal-Mart. Load child in car and drive to Food Lion. Buy the largest black garbage bags available. Go back and put those bad boys on the window with shipping tape. Problem solved, and we didn't have any more sleep issues for the remainder of the trip. Parenthood makes you industrious in all new ways. The early wakeup call threw off our plans for the day, so we headed down to the infamous Britt's Donuts around 8 a.m. for our breakfast fix. The line was long, but boy is this place worth it. Truly, the best (and most unhealthy) donuts ever. After an early nap for me and the toddler and quick lunch at the condo, we headed to the beach in the afternoon. I had been once to Carolina Beach with friends in the off-season while I was pregnant, so going when all the businesses on the island were open was a completely different experience. We enjoyed the best seafood dinners at Surf House (where Miles tried and LOVED crab and oysters) and The Shuckin' Shack, awesome Irish ice cream from Celtic Creamery, and a great lunch at Hang Ten Grill on the way out of town after visiting the NC Aquarium at Fort Fisher. Having visited beaches in the Outer Banks, Myrtle Beach, Emerald Isle, Charleston, and Beaufort, I can say that CB is probably my favorite family beach town in the Carolinas, if for nothing more than the ability to walk almost anywhere you want to go. 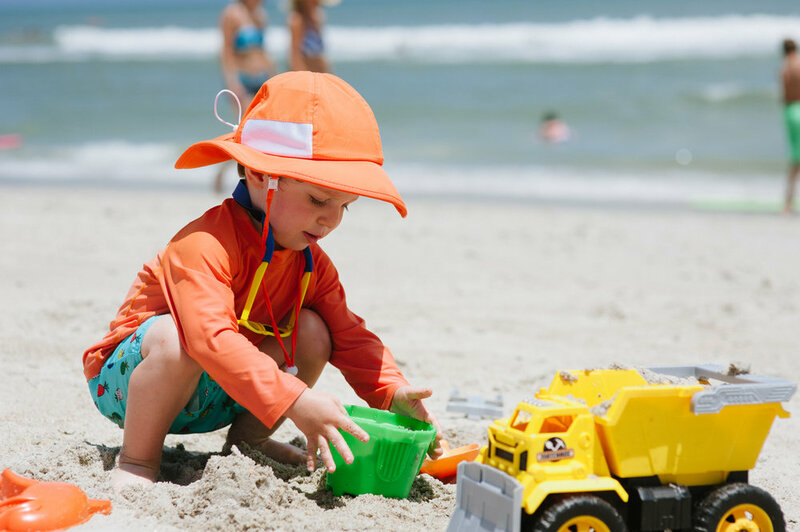 I don't know if it's my newfound level of organization since having a kid, but I will say that this was the most seamless beach trip in terms of gear and preparedness that I've ever experienced. I like to travel fairly minimally but with things that are going to make my life easy. For example, we left the stroller at home knowing that Miles could always ride on Daddy's shoulders if he got tired of walking. Travel bed- Miles just moved from a crib last week and did really well in this Intex inflatable bed. I liked it better than other options because it has the bumper on all sides. Bonus that a regular-size crib sheet fits perfectly. Tent- I had being eyeing these pop-up tents on Amazon and happened to find this exact one for about half the price at TJ Maxx. It was the perfect size for the three of us plus all of our stuff, and the window in the back kept a breeze flowing through. Easy to set up, and we had absolutely no issues with it trying to blow away with the stakes in. Beach toys - I got this simple set, and one of Miles's aunts had bought him this dump truck a few months back that we took along. He literally was entertained for hours! Cooler- I have a tote like this one that I love for beach trips. It's small, but fit enough drinks and snacks for the three of us for a few hours. Beach chairs- I replaced our old metal frame folding chairs with this pair of lounge chairs from Amazon. Since they sit flat on the ground, they easily fit in the tent, and it was easy to still play with Miles while sitting on them. Collapsible wagon- You NEED something to haul all this beach crap without looking like a pack mule. Also doubles as a child hauler. I found a great one at Academy Sports that worked just fine. There are lots of similar ones on Amazon - this wagon looks most like the one we found. Needless to say (the pictures say it all) - Miles is a total beach bum. 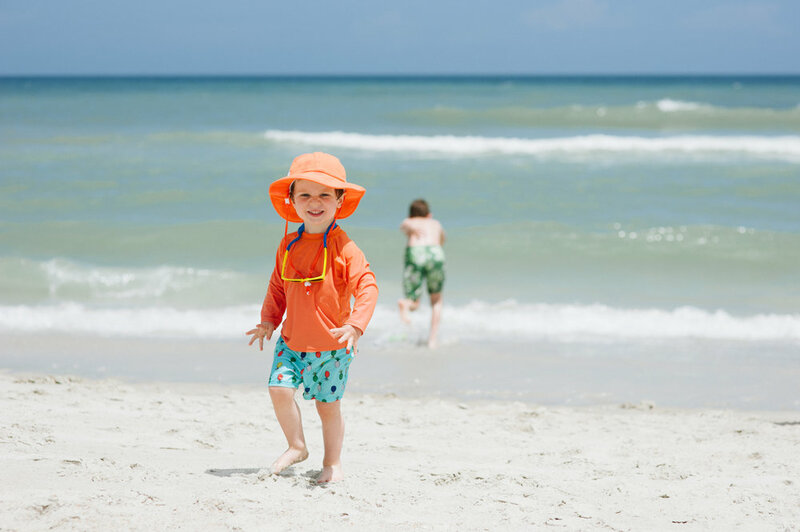 We're always looking for new adventures... Where is your favorite beach (or other destination) to vacation with young kids? Comment below!